The Bank of Lithuania have released preliminary information about the preparations which will be put into place by the Bank prior to the anticipated adoption of the EURO single currency, planned for the 1st January 2015. The Board of the Bank of Lithuania decided that the national side of the future Lithuanian euro circulation coins and cents would bear the targeted year for the adoption of the euro in Lithuania anticipated to be 2015. The first technological specimen euros with the Lithuanian national side of the “2015” issue are due to be minted by this spring. The Board of the National Bank have confirmed and commented that the Lithuanian Mint is preparing for this work intensively. Just prior to the adoption of the single currency, the Bank of Lithuania are planning to distribute over 900,000 Lithuanian euro coin starter kits with a nominal value of €11.59 with an equal value of 40 Litas. The starter kits will consist of 23 coins in total and include the following: 3 X €2 – 3 X €1 – 3 X .50 – 3 X .20 – 3 X .10 – 2 X .05 - 3 X .02 – 3 X .01. These kits are usually packaged & distributed so the public can familiarize themselves with the new coinage. Two larger kits which are aimed at commercial use will also be available no later than one month before the formal adoption of the Euro. Sixty thousand smaller commercial sets will be available which will consist of 320 euro coins valued at €111 or 383.26 Litas. The larger set will consist of 600 coins with a total nominal value of €200 or 690.56 Litas. There will be fifty thousand of these sets produced. 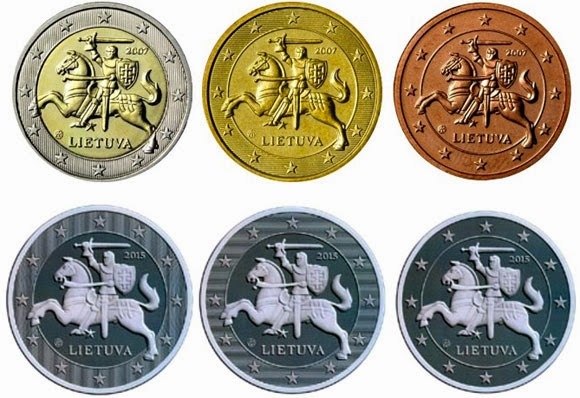 The Lithuanian circulation euro coins, whose design was finalized as far back as 2007 will all bear the national symbol which is the coat-of-arms of the State of Lithuania, the Vytis. The coins were designed by sculptor Antanas Žukauskas and depict the Vytis surrounded by 12 stars along with subtle differences on the surface rim denoting denominational differences. On the 1 and 2 euro coins, the twelve stars are against a background of vertical lines and with the 10, 20 and 50 euro cent coins, the stars are against a background of horizontal lines. The 1, 2 and 5 euro cent coins show the stars against a plain background. All eight circulation euro coin denominations featuring Vytis are due to be wholly produced at the Lithuanian Mint located in Vilnius, Lithuania’s capital. The detailed plans for the adoption of the single currency call for Euro coin starter kits for residents to be sold from the 1st December at the cash offices of the Bank of Lithuania, in commercial banks and in Lithuanian Post office branches.